A: I started training in 1985, age 12. A: I remember the green belt phase being very difficult. At the time, I did not feel like my technique was very good, and it wasn’t clear that I ever would be any good. However, I really enjoyed training, so that kept me motivated. Today, training is a part of my life, like eating and sleeping. If I’m unable to attend even a single class, I miss training right away. A: I’m a lawyer specializing in technology and entertainment. 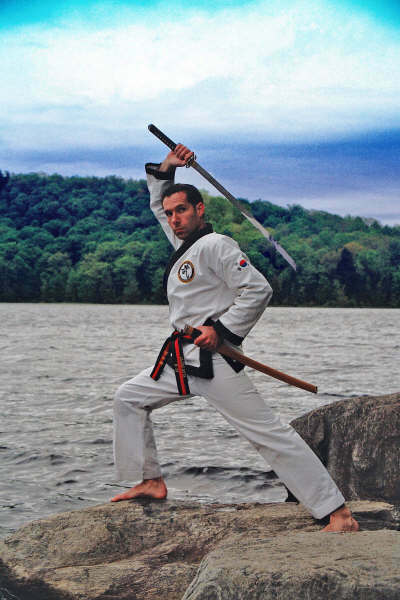 A: I’m most proud of the dojang I founded (Brown Tang Soo Do), which is now 17 years old. 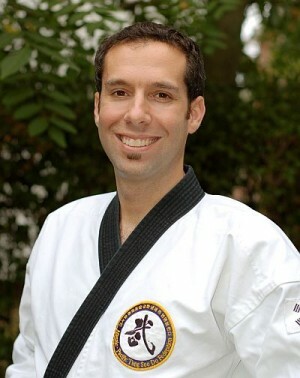 I’m also very proud of every student I’ve taught who attained his or her goal of becoming a black belt. Q: I understand that you have studied Japanese sword arts. How did you become interested in this? A: I’ve been interested in swords for as long as I can remember. As a teenager, I briefly studied Aikido to supplement my Tang Soo Do training. I didn’t really enjoy it, but the instructor also taught Iaido, which I fell in love with immediately. Unfortunately, the instructor left, so I couldn’t train with him very long. Later, in college, I met a group of Kendo players who had an informal club. I trained with them for several summers when I was away from my Tang Soo Do school. More recently, I’ve returned to Iaido, which I find very rewarding and a good supplement to my Tang Soo Do training. Q: What is your favorite martial arts book? Why? A: Hagakure is my favorite. To me, it expresses the essence of the warrior spirit. Q: You were promoted just a few months ago. What is like to be a new Master? How did you stay motivated to reach this level? A: It takes a while to get used to. After wearing a black belt for so many years, the red stripe sometimes still surprises when I open my bag and see it. Until recently, I wasn’t very focused specifically on this promotion. I always took my training one class a time. However, after being third dan for several years, Kwan Jang Nim invited me as a guest to attend the kodanja (Master’s training). This was greatest training experience in my life--being the junior student in a room full of Masters is humbling and inspirational. I was hooked instantly. I started to focus very intently on my next test. Even after a serious injury, I did everything I could to stay on track for the kodanja shim sa (Master’s test). Q: Like you, I have an interest in extending my own martial arts training into other arts, such as Kendo. Why do you feel that martial artists experience this? Is this something you would recommend to other practitioners of TSD? A: One's understanding of any art can be deepened through context. For example, by studying other martial arts, I've gained a better understanding of what makes Tang Soo Do unique and wonderful. I've also leaned that there are certain fundamental principles that are common to many martial arts. Understanding the difference between fundamental techniques and unique (or characteristic) techniques is one of things that distinguish a beginner from an advanced practitioner. So, I think it's normal for students to crave that understanding at some point in their training. It can be gained from books, films, and lectures, but I find it more enjoyable to actually try other arts and learn first-hand. I've always encouraged my own students to pursue their interest in other arts. Of course, students should always consult their instructor first to show proper respect and to ensure that their outside training enhances, rather than interferes with, their Tang Soo Do training. Q: How has your experience in Iaido changed or influenced your own TSD training? A: Korean sword arts have been heavily influenced by Chinese and Japanese sword arts over history. Iaido has helped me better understand the history and application of some of the techniques we practice in Tang Soo Do.